The evenly balanced and narrow neck flutes come with a selection of pristine tinted glass to offer a sophisticated yet stylish addition to our display cabinet and kitchen cupboard. This Christmas SCC develop new set of luxury champagne flute alongside our core work. The flute are hand made by us straight off the production line alongside structural Formula One parts, and a selection of lightweight aircraft interiors components in our ISO 9001 accredited facility. The carbon fibre stems are cured in our in-house R&D autoclave at 7 bar (peak pressure) using our finely tuned and controlled vacuum, temperature and pressure profile with our preferred in-house component pre-preg. Our in-house stock pre-preg, is a 98% is coverage tightly woven and ultra-flat twill weave fabric with close ultimate tensile strength and interlaminar shear to general purpose consumable Formula One parts. In a world full of tech where consumers can access almost any product in the world at the tap of a thumb, we wanted to produce something unique this Christmas for our family and friends to enjoy in the festive fun. We sought to develop a festive champagne flute worthy of taking to the podium after a spine tingling season on track or to be met with on a British Airways business flight to the Bahamas in an ultra-recliners premium seat. We set about creating a slim yet elegant design that would offer a feather-weight feel and well-balanced combination of glass to carbon fibre composite and a strong 4-off composite production mould to produce medium volume for our staff to take home to their families this Christmas. 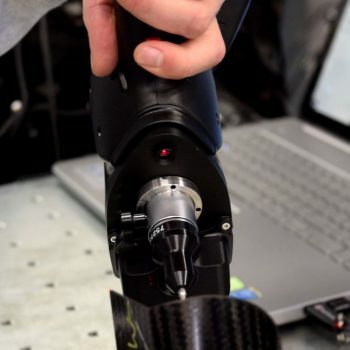 We set the task to one of our design engineers to manage the project and below gives a description of the process used to create the final product. Reverse Engineering: Our Design Engineers scanned the preferred flute shape with our state of the art Romer 3D scanning arm after applying a specialist contour discloser to help trace the 3D surface of flute, so that we could create a flue neck that would perfectly match and cup the glass shape. Making the Model: The surface model was then defeatured and smoothed to create a perfect replica CAD model of the flute neck that would perfectly fit the glass shape and sent of our Sussex based pattern making partners. Producing the Pattern: The pattern was then machined to a 0.1mm step over with industry standard blue 700kg/m3 epoxy tooling block, by our pattern making partners and hand finished to a highly polished gloss pattern block. Quality Check: The pattern is then scanned by our inspection department to for a 3D tolerance check against the original 3D CAD to ensure it meets the 25mm tolerance specified to the machinists. Manufacturing the Mould: After thoroughly prepping the flute pattern with mould release, we begin the careful process of laminating the work piece and evacuating air from the laminate through scheduled debulks in the lay-up alongside our core Formula One production line. We then make pressure checks to ensure that full vacuum is applied to the laminate and place the ‘bagged up’ workpiece into our R&D autoclave under controlled temperature, pressure and at our finely tuned settings. 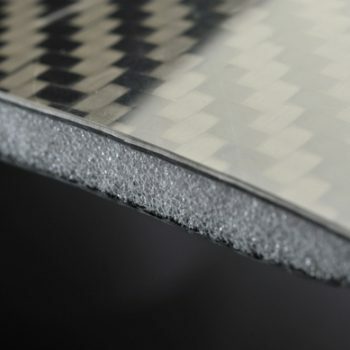 Post-cure: Once cured, the freshly moulded composite is de-moulded from the pattern and processed through its post-curing cycle with a 1°C/minute ramp up rate to 190°C to ensure that the resin matrix within composite material reaches it full mechanical proprieties and glass transition temperature. The mould is supported during its support during it’s post-curing cycle to ensure that minimal distortion to the composite occurs during this process. Quality Check: The composite mould is then taken for a second quality check with our inspection department to ensure the mould is still within the 0.25mm tolerance. Mould Trim & Finish: It is then taken to our trim and finishing department where a series of pneumatic and hand tools are used to prepare the mould, trim off rough edges, expose alignment pins and bushes to complete the working mould assembly. The mould surface is polish to the specified surface finish and thoroughly cleaned ready for prep with a chemical release agent. Component Manufacture: The completed champagne flute mould is then taken to our climate controlled clean room for carbon fibre lamination using our standard grade component pre-preg, normally reserved for R&D projects. The laminator carefully manipulated the carbon fibre, draping it into each side of the mould according to the laminating schedule whilst making sure that the material is in full contact with the mould surface using a series of custom laminating tools. The laminate then goes through a series of scheduled debulks to ensure that the plies of laminate are consolidated as much it can be at ambient temperature against the mould surface. In the more acute angles of the mould, in some cases a light application of heating is applied to soften the laminate, which enables it reach deeper parts of the mould surface. The two halves of the mould are then carefully assembled together, wrapped in a heavy gauge breather layer and sealed in a fresh vacuum bag for its final pressure debulk. A pressure check is then made to ensure that there is no air leaking into the bag before its placed into the autoclave, as this may compromise the quality of the components consolidation. Component Curing: The component is then cured according to our standard grade pre-preg datasheet curing schedule in our R&D autoclave with fully traceable, vacuum, temperature and pressure, to ensure that the composite material is fully cured and reaches its full mechanical properties. Component De-mould & Trimming: The champagne flutes stems are then de-mould and taken to the trimming and finishing department, to cut away flash/excess material according to the technical drawings by our skilled trim shop technicians. Surface Preparation & Bonding: The original glass flute is then sliced at the meeting point of the stem and the liquid containing compartment. The liquid containing compartment is then carefully masked up with tape to expose the base and is sand blasted with F280 grit abrasive compound to prepare the area for bonding to the stem. We then used 3M 9323 aerospace structural adhesive to permanently bond the two parts together and create the beautiful flute that you see in the image above. If you’ve like to get hold of set champagne glasses feel free to get in contact with us by clicking here. The flutes come in a set of 4 with a selection of subtly tinted or clear glass tops.